The Angling Trust and Canal & River Trust, Canal Pairs tickets for 2019 have gone LIVE this week, offering canal anglers up and down the country a great chance at getting into a BIG money final. 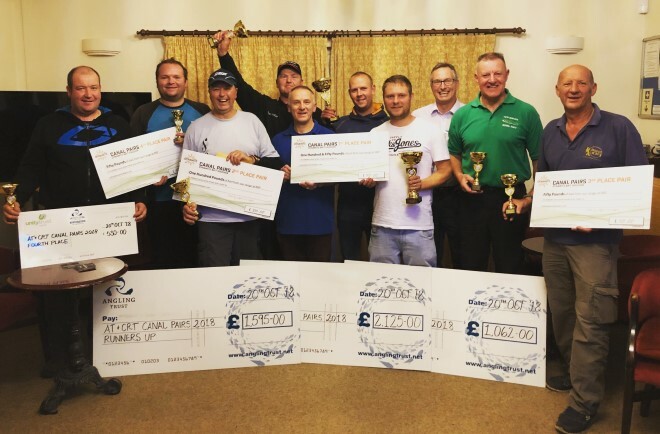 Organised by the Angling Trust in conjunction with the Canal & River Trust, the Championship will see sixteen regional qualifying heats taking place across England with further heats being held in Wales, Ireland and Scotland. Tickets can be purchased through the Angling Trust’s Online Booking System at a cost of £40 per pair per qualifier. This makes the contest one of the most affordable ‘Big Finals’ in the whole match calendar. Prize money for the 2019 competition final, which is subject to entry, could total over £18,000 between the top four pairs. “We’ve worked closely with the Canal & River Trust to tweak the contest for 2019, eradicating any fastest losers procedures and putting in plenty of geographically diverse qualifiers. At £40 a pair I know I’ll be chancing my arm once more this year! “We’re really pleased to launch the tickets for the 2019 Canal Pairs Championship, it’s proven really popular in recent years. We’ve listened to competitors and tweaked the qualifying rules with a minimum of three pairs now going through to the final from each qualifier. There were some great performances from some ‘lesser known names’ in this year’s final which just goes to show that any pair could win this event in 2019. The Canal Pairs Championship Final will take place on Saturday 19th October on the Shropshire Union Canal – one section at Little Onn and another at Norbury Junction. To keep up to date on all the qualifiers results head over to the Angling Trust Competitions page on Facebook.